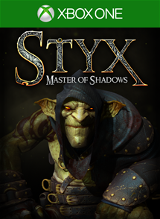 So you want to unlock all the skills and get the full 1000gs in Styx: Master of Shadows? Well you need to complete every single side-objective and every single Insignia (Shadow, Mercy, Swiftness and Thief) and you will JUST have enough SP. So here is a little guide to getting all of the Insignias. Your best bet is going to be doing 2 runs at each level. Your first run is to get Shadow, Mercy and Swiftness. Get the levels done quickly with no alerts and no kills. Your second run is to get Side Objectives, Relics, and the Tokens. A lot of the Side Objectives take precious time and doing them without alerts or kills can be anywhere from hard to impossible. Found this YouTuber who is doing full runs getting all three Insignias. Once unlocked, the Predator skill Omniscience (300 skill points), allows you to see all tokens and enemies even through walls. Here are some videos we’ve been working on showing the exact locations of all the Tokens. Work In Progress. We’ll try to get everything uploaded ASAP. Iron Banner is here! The newest update for destiny is Crucible with a twist. You know how your level, gear, and weapon’s attack don’t really influence the crucible to much? Other than providing different strategies and game-play. Well in the Iron Banner everything matters. If you’ve got Raid gear, Exotic weapons, and fully upgraded legionaries than you already have the advantage. The Iron Banner is where to go to show off how truly powerful you are with all the amazing gear and weapons you’ve acquired. I wanted to quickly start off with a little bit of my own thoughts. Overall I was expecting a much bigger difference for Iron Banner over Crucible. I’m level 28 with a few really nice weapons. So I thought I’d have a big advantage over some wet behind the ears level 22 scrub. And I also thought if some Raid master level 30 guy showed up I’d be screwed. When you think about it, if you are level 20 and you try a level 26 mission it’s nearly impossible. And if you’re level 28 and you go patrol earth with level 2 enemies you tear them to shreds. So I expected that same scale for Iron banner. But really the difference is minimal. As I was playing a match I had the same success as normal. It didn’t feel like I died quicker or slower or that I killed quicker or slower. Everyone in the room was anywhere from level 24 to level 29. But overall it didn’t seem like it mattered. Same old crucible, which is fine, I still have fun and usually play quite well, but it was a surprise. Then suddenly a level 2 guy showed up! LEVEL 2! OOOOO I can’t wait to kill with with one bullet right? Ehhhh not so much. He did take maybe 2 or 3 bullets less for my Surgos Regime, but for someone 26 levels lower I thought it would be a much bigger difference. What’s the point in my 300 attack gun when he’s got 76 defense? Shouldn’t he disintegrate when I just look at him? Yes he’s weaker for sure than me. But I expected a big difference, not just 2 or 3 bullet difference. I was even more surprised when he sniped me with two shots. The first shot took out all but a hair of my shields, the next one finished me off. The attack on that level 2 sniper must be incredibly small. How’d it two shot me with my 1,275 defense? 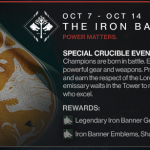 Overall, like I’ve said a bunch of times, I’m confused that the difference in Iron Banner isn’t as advertised. Skill still wins, and that’s awesome, but I thought Iron Banner was more of a show-off version of the crucible and it doesn’t quite seem so. Getting to rank 1 is very easy, you only need 100 reputation points. Rank 2 is much longer, but still a lot shorter than the average rank 2 for other things like vanguard, crucible, etc. To get to Rank 2 you need 1,200 more reputation. For rank 3, well I’ll let you know as soon as I get to it! Also I want to know if you can get a free legendary for making rank 3, like you do with everything else, I’m going to get there and test that out and let you know. Here’s a list of everything sold at the IRON BANNER store. –TWO SHADERS: 1,000 Glimmer for the rank 1 shader and 3,000 Glimmer for the rank 3 shader. –TWO EMBLEMS: 1,000 Glimmer for the rank 1 shader and 3,000 Glimmer for the rank 3 shader. –CLASS ITEM: There’s one class item for each class, it costs 2,000 Glimmer and requires rank 2. –WEAPONS: As of now there’s just one weapon for sale, 10 marks and requires rank 3. JOLDER’S HAMMER~Machine Gun: You need to be Rank 3 to be able to purchase this, it costs 10 marks. From looking at the stats it looks like it’s pretty lame. Only 26 bullets in the clip. Very nice impact and good rate of fire. But everything else is very low including terrible stability. –GEAR: Here’s where it get’s interesting. There are not the same amount of options available for every class. The Hunter only has one option and so does the Warlock but the the Titan has two. These options are for different pieces of gear too, some for chest and some for gauntlets. I’m not sure why they did this, it’s confusing to me. But here’s the list of each one nonetheless. There are Iron Banner specific bounties for the new destiny update. These bounties give you XP as well as Iron Banner Reputation that is good for buying items from Lord Saladin(he’s the world biggest salad fan). The Iron Banner bounties can only be progressed and unlocked in the Iron Banner. However if you want to unlock Crucible bounties while in the Iron Banner that works just fine. So once you complete the Iron Banner bounties go get come Crucible ones as well so you can work on those. Here are a list of the bounties that were given for day one. RISE ABOVE: Complete an Iron Banner match with the highest score. Worth 100 Iron Banner Rep and 5,000 XP. FOCUSED AGGRESSION: Defeat 50 Guardians with Auto Rifle headshots while completing in the Iron banner tournament. Worth 50 Iron Banner Rep and 2,500 XP. As you can see, nothing to crazy and out of the ordinary. As soon as we find out more info we will fill in the gaps and let you know. 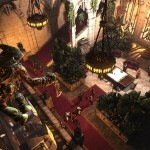 Defense Grid 2 is a tower defense style strategy game in the same vein as its predecessor, Defense Grid: The Awakening. The aim of the game is to stop aliens from invading your base and stealing your precious power cores by placing upgradeable towers on the map. If you lose all of them it is game over. The great thing about Defense Grid is how it differs from other tower defense games I have played. When an alien steals a power core it isn’t gone until said alien leaves the map with it. So you can scramble and kill the retreating aliens with added towers if need be whilst they try and escape the map. I found that I was killing the majority of aliens whilst escaping. At the start of each mission you are given a set amount of resources to spend on buying towers. You get to choose from 9 different towers ranging from guns to missiles and lasers, along with a booster tower which increases the effectiveness of any tower you place on top of it. Each tower can be upgraded a maximum of two times. All of which will cost you more resources which will consistently replenish throughout the mission. You also get extra resources as a wave end bonus at the end of certain waves. As you progress through the missions, you can be randomly rewarded with tower augmentations which you can equip to your towers (one at a time) to increase their power or add abilities such as targeting the most powerful enemy first. Defense Grid 2 does a great job of incorporating the different towers as you progress through the missions so you are not bombarded with too many options from the word go. Along with being able to place towers on the map, you also have a special ability to use which is determined by which Command Team you choose to take with you on the mission. After using all abilities in different situations, I never really used them again as there was no need for it. Maybe if I was competent enough to play through it on a harder difficulty level (yes, I am a strategy baby, so I played it on Easy…but I’m World number 1 on mission 11!) the special abilities would have played a larger part in my strategies. Yeah, proud of that. Leaderboards are a prominent feature and in each mission your score is racing against your friend with the closest score. At the end of each mission, based on your performance you can receive a Bronze, Silver or Gold medal. I can’t give you the requirements for scoring well in the game as I have received Gold medals with only one power core remaining, all power cores remaining and using all resources or hardly spending any at all. So it is a bit confusing how consistently get high scores. The missions in this game are not short by any means. With some missions having 100 waves of aliens, you will notice that they can take up quite a significant chunk of time. But with the RB button, you can speed the game up. If it wasn’t for this feature I can honestly say I would have been bored out of my mind within the first few missions. The default speed the aliens attack is mind numbingly slow. I would have preferred it if there was a slow down button with the sped up game play being the default. I only ever played on the default speed at the beginning of each mission to set my initial towers and if all my power cores had been stolen. The other quite nifty feature is the ability to revert to your last checkpoint by pressing LB. In too deep with wave 48 of 50 and wished you had a set of concussion towers next to the base? Tap that LB button and go back in time unpunished. I didn’t actually use this feature much, mostly due to the fact I was playing on Easy, but I can see how this feature can be indispensable for strategists playing on the higher difficulties. Speaking of the difficulty level, as I mentioned above, I played through the campaign on Easy after dabbling with the Normal difficulty and having my rear handed to me on a plate several times over. I have no idea how anyone can complete the game on Hard, never mind the highest difficulty, Elite. With that being said, Easy was just too easy. Unless there was more than one core to defend, I could literally use exactly the same defense layout on each mission. It didn’t even seem to matter what towers I used either. I managed to get gold ratings on every mission I played whilst grinding out some of the achievements for placing 100 of each tower. Including the prologue, there are 21 missions to go through in the single player portion of the game. Each mission begins with a wall of text for you to read which gives you the outline of the story, which is bland at best. Not really worth mentioning to be honest. Each Command Team you encounter has their own dialogue and whilst some of the dialogue can be quite amusing, they don’t really add anything to the story at all. Although 21 missions doesn’t sound like much, each mission has plenty of different challenge modes to choose from, really adding a huge amount of replayability to the game. Each challenge mode has certain rule changes for example, in ‘Out of Bullets’ you are tasked with defending your base without the use of Gun or Cannon towers. General Fletcher showing off some of his British wit. Something I noticed that Hidden Path Entertainment should really be commended for is the inclusion of a community suggested game type. In the first 7 missions there is a challenge mode called ‘Fully Loaded’ which gives you all tower types to beat that mission and they have even credited the community member for the suggestion which I think is a really nice touch. Although I found the story uneventful, the levels couldn’t be more opposite. Yes, the levels look unappealing to me and they look very similar, but each one plays very differently. Some levels have you defending one base with a myriad of options as to where to put your towers, as well as several paths for the aliens to attack your base. In those instances you have to block off the paths with towers to funnel the aliens towards the path you want them to take. Others have you defending two bases with several paths where aliens could attack from or a set path with limited options as to where to put down your defenses. On top of this variation, some later levels change their structure by adding sections of the map for the aliens to divert across. If you find yourself overwhelmed in a certain area, you can buy extra sections of the map by using the command shuttle to sway the tide in your favor. Speaking of the many game modes, Defense Grid 2 comes with three multiplayer modes. The first one is DG Fighter where you compete against another player and any aliens you defeat will appear on their side of the map and vice versa. The second is Co-op Doubles which has two players working together on a single map. Lastly there is DG Coordinated Defense which has you and another player attacking the same aliens on the same map but you each get allocated positions for your towers to be placed. I cannot really give much of an opinion on these modes because I was unable to find a match. Whilst searching for a match you can continue playing missions on single player if you wish, which is something more games should definitely incorporate. Even though Defense Grid 2 has an immense amount of replayability, the high price tag that comes with it will probably make a lot of gamers that aren’t already a fan of Defense Grid to go get their fix elsewhere until it either appears on sale or as a free download as part of Games With Gold. Although I do feel the price point is a bit lofty, if you enjoy Tower Defense games you will not be left disappointed. That there, is the problem. Unless the price decreases, Defense Grid 2 is only really going to appeal to that niche audience in my opinion. Onto my favorite part of every game…the achievements. Defense Grid 2 boasts a huge list of achievements, 65 to be exact. Ranging from placing 100 of each tower to defeating 50,000 aliens and the humdinger of them all, achieving 100 Gold Medals across any mission. You get 21 Gold Medals from the story mode, the rest are going to be obtained from completing all the different types of challenge modes for the missions. There are plenty to choose from but it is a bit of a grind. I’m sitting at just under 40 right now and took a break from it. But I am looking forward to picking it back up in a few days to get the remaining 60ish. All in all it is a good list with a variety of tasks you need to perform. Just a little note, any achievements that you should unlock during a mission will not unlock until after the mission is complete, so don’t panic! 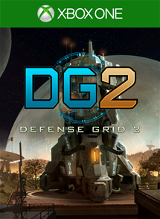 Overall, Defense Grid 2 is a fantastic addition to the Tower Defense genre with spectacular level designs that will really get you thinking about where to put your defenses. Although the story is severely lacking, the sheer amount of different game modes available more than makes up for it. The only real sticking point is the price. These all require you to earn enough SP to unlock them by completing objectives and earning insignias in missions. Then you can spend the SP on skills while at the hideout. Skill KILL – then it’s the first ability, COVERED KILL. It costs 40 SP. Simply use RT to hug a wall, as a guard walks past you will get the option to use X to do a kill. Skill KILL – then it’s the second ability, AERIAL KILL. It costs 60 SP. Then get above an enemy and jump towards them. While in the air hit X to perform a aerial kill. Skill CLONING – then it’s the first ability, BIND. It’s costs 30 SP. When you get close to a enemy as a clone you can press X to Bind them. Then switch to Styx and run over and kill the guard while he tries to wrestle your clone off. Spawn a clone and then have them enter a closet or chest. Then either wait for a guard to wander by on his own or alert him and lead him to your clone. The 3rd ability in the Clone skill tree is an Advanced Smoke Bomb that will make this easier to get. Then round up 3 guards, set off the smoke bomb before they can kill your clone. That’s it. I thought you had to eliminate the guards but it unlocks right as you set off the smoke bomb. All of these can be accomplished once you find a suitable spot by saving your game, doing the requirement once and then reloading and starting over. All of these will also of course unlock over the course of the game but you wouldn’t be reading an achievement guide if you didn’t want your achievements ASAP. You should work on these 3 together. Make sure you have 2 Amber Vials and save the game near a guard. Summon a Clone with LT+A getting 1 create. Run the clone into a guard getting 1 death. Then drink 1 potion for Unquenched. Do that pattern once more, then reload. Some flames can be extinguished just by walking up to them and pressing Y. You can also use the Sand item to extinguish from a distance. This is not something you need to worry about though. You will get near the entire 30 just in the opening mission if you makes sure to do it every chance you get. There are some flames that can not be extinguished. Lots of doors in the Intro mission. If you really really really want this one bad just save before a door. Unlock and open it, reload, repeat, etc. 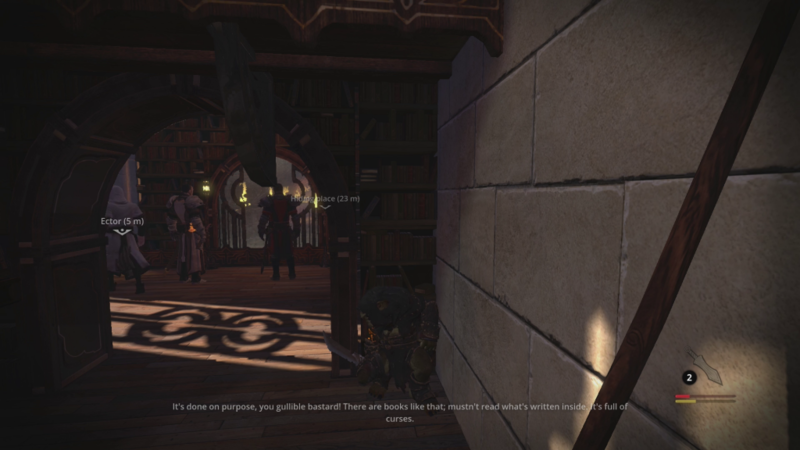 You will visually see if a guard has an item you can pickpocket. If they do get close and hit Y to grab it. You have to have room for the item to be able to grab it. Also, if you kill the guard first the item is destroyed. 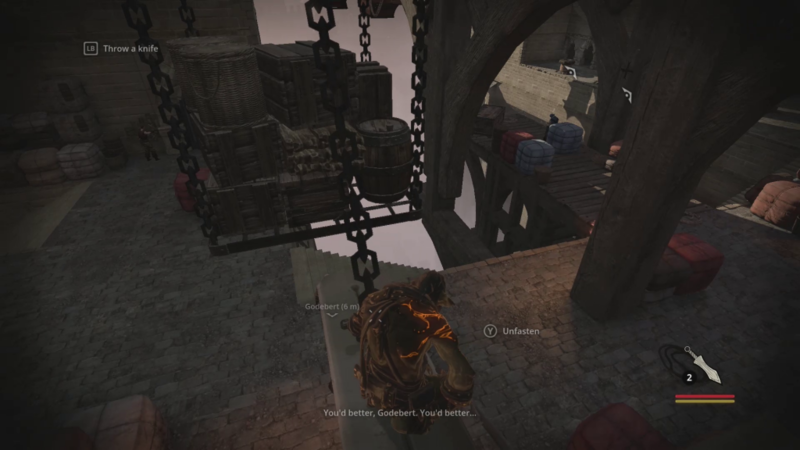 Near the start of the second mission, Akenash’s Atrium, there is a guard going up and down some long stairs that has a Throwing Knife to pickpocket. He’s on the right side of the level right near a wooden platform you can hide under. Have one on you when you get here so you have room to pickpocket one. Save the game and then use it on him and another nearby guard. 1 Pickpocket and 2 Throwing Knife kills. Only the Muffled Kills you get from sneaking up on an enemy and holding Y count for this achievement. Throwing Knifes, Chandeliers, Muffled Kills. Whatever you want to use. Just make sure it adds up to 200. Any open combat is considered a duel. Simply Parry until you get the Kill with X option. All of these are for doing specific requirements at a specific time. We’ll tell you an easy place to do them. You just go there and do it! Intro mission Reminiscence. Right after you get your dagger you will come out and face the World Tree. Climb up to the first beam and head out to the edge looking at the World Tree and a song will start. It’s about 2 minutes. Just wait out the song for the achievement to unlock. Mission 1: Akenash’s Atrium, Section 1. You will be given a sub quest by your friend in the hideout to kill Godebert. You will find him on the way through the mission conveniently standing under a crate. 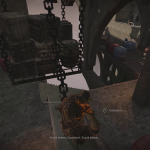 Simply climb the sacks beside him and unfasten the crates. It will kill both Godebert and his friend giving you the achievement but since his friend also dies it will count against No Kills. Mission 1: Akenash’s Atrium, Section 3. As you start to follow Ector you will go up some stairs. At the top is a food bag you can Poison. Then move slowly towards the 2 guards we are talking. When they finish talking one with path around and eat the food and after a bit drop dead giving you the achievement. Reload to a previous save if you are going for no kills. First one I found was in mission 3, Deliverance in Section 3, Laboratories. You will come to a section that is most definitely a torture chamber. Save the game before engaging the enemies. There was a basic white robed enemy, a black robed torturer and a knight. I throwing knifed the basic enemy and engaged the torturer to a duel. Once he was down the achievement unlocked. Then die to the knight and reload so you don’t have a kill on this mission. Immediately after the torturer area in Deliverance – Laboratories you are introduced to orcs. Simply create a clone and walk it up to a orc in a cell. The orc will reach through and grab it and achievement unlocked. These all relate to finishing missions in specific ways. For the most part you want to try for no alerts, no kills for your first run. Then murder everyone to get them out of the way and search for those tokens. These all will unlock at the ending stat screen for the missions. This is for getting all the Relics in the game. Each mission contains one Relic. Under the Pause menu you can tab over to the Relic section and get a visual clue as to where the Relic is in the level. This is fairly simple on any mission because you can save and reload as much as you want. Very easy during the Intro mission. Obviously if you are going for a no kill run then you get this since there were no bodies to be found. If you do have to kill someone just make sure to hid the body in any of the billion hiding spots that are everywhere. You will need ALL of the available SP for this. 1330 SP to fully unlock the first 6 sets of skills. The Predator set unlocks by completing 2 complete sets of skills. This set contain 4 really powerful abilities but cost you another 990 SP. You must complete ALL side objectives and ALL Insignias for this. Every single point is required. I did this on Mission 2, Master Key. Just don’t use any items. You can call your Clone, but don’t drink any Amber, don’t drink any Life, etc, etc. There are 4 Insignias you can earn at the end of each mission. This includes Reminiscences, the intro. Shadow is for have no alerts triggered. Only RED alarms matter. You can go Yellow and Orange all you want. You can use a TON of saves and just reload if you get seen. If you miss it on the first playthrough of a mission when you replay in the pause menu you can see how many alerts you have set off. Only Human and Elf alarms matter and alarms for your clone don’t count against you. Although not mentioned, Clone alerts on The Creator and Renaissance count against you also.